Larry Ellison co-founded Oracle Corporation in 1977 with Bob Miner and Ed Oates Normand Beauchamp under the name Software Development Laboratories (SDL). Ellison took inspiration from the 1970 paper written by Edgar F. Codd on relational database management systems (RDBMS) named "A Relational Model of Data for Large Shared Data Banks." He heard about the IBM System R database from an article in the IBM Research Journal provided by Oates. Also derived from Codd's theories, Ellison wanted to make Oracle's product compatible with System R, but failed to do so as IBM kept the error codes for their DBMS a secret. SDL changed its name to Relational Software, Inc (RSI) in 1979, then again to Oracle Systems Corporation in 1982, to align itself more closely with its flagship product Oracle Database. At this stage Bob Miner served as the company's senior programmer. In 1995, Oracle Systems Corporation changed its name to Oracle Corporation, officially named Oracle, but sometimes referred to as Oracle Corporation, the name of the holding company. Part of Oracle Corporation's early success arose from using the C programming language to implement its products. This eased porting to different operating systems (most of which support C). Oracle designs, manufactures, and sells both software and hardware products, as well as offers services complementing them (such as financing, training, consulting, and hosting services). Many of the products have been added to Oracle's portfolio through acquisitions. Oracle's E-delivery service (Oracle Software Delivery Cloud) provides generic downloadable Oracle software and documentation. Release 11: Release 11g became the current Oracle Database version in 2007. Oracle Corporation released Oracle Database 11g Release 2 in September 2009. This version was available in four commercial editions—Enterprise Edition, Standard Edition, Standard Edition One, and Personal Edition—and in one free edition—the Express Edition. The licensing of these editions shows various restrictions and obligations that are considered complex. The Enterprise Edition (DB EE), the most expensive of the Database Editions, has the fewest restrictions — but nevertheless has complex licensing. Oracle Corporation constrains the Standard Edition (DB SE) and Standard Edition One (SE1) with more licensing restrictions, in accordance with their lower price. Release 12: Release 12c became available on July 1, 2013. Oracle Rdb, a relational database system running on OpenVMS platforms. Oracle acquired Rdb in 1994 from Digital Equipment Corporation. Oracle has since made many enhancements to this product and development continues as of 2008. Oracle Fusion Middleware is a family of middleware software products, including (for instance) application server, system integration, business process management (BPM), user interaction, content management, identity management and business intelligence (BI) products. Oracle Secure Enterprise Search (SES), Oracle's enterprise-search offering, gives users the ability to search for content across multiple locations, including websites, XML files, file servers, content management systems, enterprise resource planning systems, customer relationship management systems, business intelligence systems, and databases. Released in 2008, the Oracle Beehive collaboration software provides team workspaces (including wikis, team calendaring and file sharing), email, calendar, instant messaging, and conferencing on a single platform. Customers can use Beehive as licensed software or as software as a service ("SaaS"). Oracle also sells a suite of business applications. The Oracle E-Business Suite includes software to perform various enterprise functions related to (for instance) financials, manufacturing, customer relationship management (CRM), enterprise resource planning (ERP) and human resource management. The Oracle Retail Suite covers the retail-industry vertical, providing merchandise management, price management, invoice matching, allocations, store operations management, warehouse management, demand forecasting, merchandise financial planning, assortment planning and category management. Users can access these facilities through a browser interface over the Internet or via a corporate intranet. Development of applications commonly takes place in Java (using Oracle JDeveloper) or through PL/SQL (using, for example, Oracle Forms and Oracle Reports/BIPublisher). Oracle Corporation has started a drive toward "wizard"-driven environments with a view to enabling non-programmers to produce simple data-driven applications. Oracle Corporation works with "Oracle Certified Partners" to enhance its overall product marketing. The variety of applications from third-party vendors includes database applications for archiving, splitting and control, ERP and CRM systems, as well as more niche and focused products providing a range of commercial functions in areas like human resources, financial control and governance, risk management, and compliance (GRC). Vendors include Hewlett-Packard, UC4 Software and Knoa Software. Oracle Enterprise Manager (OEM) provides web-based monitoring and management tools for Oracle products (and for some third-party software), including database management, middleware management, application management, hardware and virtualization management and cloud management. The Primavera products of Oracle's Primavera Global Business Unit (PGBU) consist of project-management software. ORAchk (formerly RACchk) examines software in the Oracle software stack and reports on issues. Many external and third-party tools make the Oracle database administrator's tasks easier. ZFS combines file-system and logical volume management functionality. Oracle Corporation develops and supports two operating systems: Oracle Solaris and Oracle Linux. Platform services on which to build and deploy applications or extend SaaS applications: database, Java application server, mobile, business analytics, integration, process, big data, Internet of Things, Node.js etc. On July 28, 2016 Oracle bought NetSuite, the very first cloud company, for $9.3 billion. Product support: Oracle Corporation identifies its customers and their support entitlements using CSI (Customer Support Identifier) codes. Registered customers can submit Service Requests (SRs)—usually via the web-accessible My Oracle Support (MOS). Critical Patch Updates: since 2005, Oracle Corporation has grouped collections of patches and security fixes for its products each quarter into a "Critical Patch Update" (CPU), released each January, April, July and October. Oracle Configuration Manager (OCM, previously Customer Configuration repository or CCR) gathers and uploads details of the configuration of Oracle software. Oracle Auto Service Request (ASR) automatically creates Service Requests for specific hardware faults on qualified Oracle server, storage, Oracle Exadata, and Oracle Exalogic products. In 1990, Oracle laid off 10% (about 400 people) of its work force because of accounting errors. This crisis came about because of Oracle's "up-front" marketing strategy, in which sales people urged potential customers to buy the largest possible amount of software all at once. The sales people then booked the value of future license sales in the current quarter, thereby increasing their bonuses. This became a problem when the future sales subsequently failed to materialize. Oracle eventually had to restate its earnings twice, and also settled (out of court) class-action lawsuits arising from its having overstated its earnings. Ellison stated in 1992 that Oracle had made "an incredible business mistake." Although IBM dominated the mainframe relational-database market with its DB2 and SQL/DS database products, it delayed entering the market for a relational database on UNIX and Windows operating systems. This left the door open for Sybase, Oracle and Informix (and eventually Microsoft) to dominate mid-range and microcomputers. Around this time, Oracle technology started to lag technically behind that of Sybase. In 1990–1993 Sybase became the fastest-growing database company and the database industry's darling vendor, but soon fell victim to its merger mania and to technical issues with System X. Sybase's 1993 merger with Powersoft resulted in its losing its focus on its core database technology. In 1993, Sybase sold the rights to its database software running under the Windows operating system to Microsoft Corporation, which now markets it under the name "SQL Server." In 1994, Informix overtook Sybase and became Oracle's most important rival. The intense war between Informix CEO Phil White and Ellison made front-page news in Silicon Valley for three years. Informix claimed that Oracle had hired away Informix engineers to disclose important trade secrets about an upcoming product. Informix finally dropped its lawsuit against Oracle in 1997. In November 2005, a book detailing the war between Oracle and Informix was published, titled The Real Story of Informix Software and Phil White. It gave a detailed chronology of the battle of Informix against Oracle, and how Informix Software's CEO Phil White landed in jail because of his obsession with overtaking Ellison. Once it had overcome Informix and Sybase, Oracle Corporation enjoyed years of dominance in the database market until use of Microsoft SQL Server became widespread in the late 1990s and IBM acquired Informix Software in 2001 (to complement its DB2 database). Today Oracle competes for new database licenses on UNIX, Linux, and Windows operating systems primarily against IBM's DB2 and Microsoft SQL Server. IBM's DB2 still dominates the mainframe database market. In 2004, Oracle's sales grew at a rate of 14.5% to $6.2 billion, giving it 41.3% and the top share of the relational-database market (InformationWeek – March 2005), with market share estimated at up to 44.6% in 2005 by some sources. Oracle Corporation's main competitors in the database arena remain IBM DB2 and Microsoft SQL Server, and to a lesser extent Sybase and Teradata, with open-source databases such as PostgreSQL and MySQL also having a significant share of the market. EnterpriseDB, based on PostgreSQL, has recently made inroads by proclaiming that its product delivers Oracle compatibility features at a much lower price-point. In the software-applications market, Oracle Corporation primarily competes against SAP. On March 22, 2007 Oracle sued SAP, accusing them of fraud and unfair competition. In the market for business intelligence software, many other software companies—small and large—have successfully competed in quality with Oracle and SAP products. Business intelligence vendors can be categorized into the "big four" consolidated BI firms such as Oracle, who has entered BI market through a recent trend of acquisitions (including Hyperion Solutions), and the independent "pure play" vendors such as MicroStrategy, Actuate, and SAS. Oracle Financials was ranked in the Top 20 Most Popular Accounting Software Infographic by Capterra in 2014, beating out SAP and a number of their other competitors. From 1988, Oracle Corporation and the German company SAP AG had a decade-long history of cooperation, beginning with the integration of SAP's R/3 enterprise application suite with Oracle's relational database products. The marketplace regarded the two firms' products as complementing one another, rather than as substitutes. Despite the current SAP partnership with Microsoft, and the increasing integration of SAP applications with Microsoft products (such as Microsoft SQL Server, a competitor to Oracle Database), Oracle and SAP continue their cooperation. According to Oracle Corporation, the majority of SAP's customers use Oracle databases. In recent years, however, competition between Oracle and SAP has increased, and as a result, the rivalry between the two companies has grown, even developing into a feud between the co-founders of the two companies, where one party would frequently voice strong negative comments about the other company. In 2004, Oracle began to increase its interest in the enterprise-applications market (in 1989, Oracle had already released Oracle Financials). A series of acquisitions by Oracle Corporation began, most notably those of PeopleSoft, Siebel Systems and Hyperion. SAP recognized that Oracle had started to become a competitor in a market where SAP had the leadership, and saw an opportunity to lure in customers from those companies that Oracle Corporation had acquired. SAP would offer those customers special discounts on the licenses for its enterprise applications. Oracle Corporation would resort to a similar strategy, by advising SAP customers to get "OFF SAP" (a play on the words of the acronym for its middleware platform "Oracle Fusion for SAP"), and also by providing special discounts on licenses and services to SAP customers who chose Oracle Corporation products. Currently Oracle and SAP (the latter through its recently acquired subsidiary TomorrowNow) compete in the third-party enterprise software maintenance and support market. On March 22, 2007, Oracle filed a lawsuit against SAP. In Oracle Corporation v. SAP AG Oracle alleged that TomorrowNow, which provides discount support for legacy Oracle product lines, used the accounts of former Oracle customers to systematically download patches and support documents from Oracle's website and to appropriate them for SAP's use. Some analysts have suggested the suit could form part of a strategy by Oracle Corporation to decrease competition with SAP in the market for third-party enterprise software maintenance and support. On July 3, 2007, SAP admitted that TomorrowNow employees had made "inappropriate downloads" from the Oracle support website. However, it claims that SAP personnel and SAP customers had no access to Oracle intellectual property via TomorrowNow. SAP's CEO Henning Kagermann stated that "Even a single inappropriate download is unacceptable from my perspective. We regret very much that this occurred." Additionally, SAP announced that it had "instituted changes" in TomorrowNow's operational oversight. On November 23, 2010, a U.S. district court jury in Oakland California found that SAP AG must pay Oracle Corp $1.3 billion for copyright infringement, awarding damages that could be the largest-ever for copyright infringement. While admitting liability, SAP estimated the damages at no more than $40 million, while Oracle claimed that they are at least $1.65 billion. The awarded amount is one of the 10 or 20 largest jury verdicts in U.S. legal history. SAP said they were disappointed by the verdict and might appeal. On September 1, 2011, a federal judge overturned the judgment and offered a reduced amount or a new trial, calling Oracle's original award "grossly" excessive. Oracle chose a new trial. On August 3, 2012, SAP and Oracle agreed on a judgment for $306 million in damages, pending approval from the U.S. district court judge, “to save time and expense of [a] new trial". After the accord has been approved, Oracle can ask a federal appeals court to reinstate the earlier jury verdict. In addition to the damages payment, SAP has already paid Oracle $120 million for its legal fees. For the Oracle Database: "Can't break it, can't break in" and "Unbreakable"
Enabling the Information Age Through Network Computing"
As of 2008: "The Information Company"
As of 2010: "Software. Hardware. Complete." As of late 2010: "Hardware and Software, Engineered to Work Together"
As of mid 2015: "Integrated Cloud Applications and Platform Services"
Oracle Corporation produces and distributes the "Oracle ClearView" series of videos as part of its marketing mix. In 2000, Oracle attracted attention from the computer industry and the press after hiring private investigators to dig through the trash of organizations involved in an antitrust trial involving Microsoft. The Chairman of Oracle Corporation, Larry Ellison, staunchly defended his company's hiring of an East Coast detective agency to investigate groups that supported rival Microsoft Corporation during its antitrust trial, calling the snooping a "public service." The investigation reportedly included a $1,200 offer to janitors at the Association for Competitive Technology to look through Microsoft's trash. When asked how he'd feel if others were looking into Oracle's business activities, Ellison said: "We will ship our garbage to Redmond, and they can go through it. We believe in full disclosure." "Can't break it, can't break in"
In 2002, Oracle Corporation marketed many of its products using the slogan "Can't break it, can't break in," or "Unbreakable." This signified a demand on information security. Oracle Corporation also stressed the reliability of networked databases and network access to databases as major selling points. However, two weeks after its introduction, David Litchfield, Alexander Kornbrust, Cesar Cerrudo and others demonstrated a whole suite of successful attacks against Oracle products. Commentators criticized the slogan as unrealistic and as an invitation to crackers, but Oracle Corporation's chief security officer Mary Ann Davidson portrayed the criticism as unfair. Rather than representing a literal claim of Oracle's products' impregnability, she saw the campaign in the context of fourteen independent security evaluations that Oracle Corporation's database server had passed. In 2004, then-United States Attorney General John Ashcroft sued Oracle Corporation to prevent it from acquiring a multibillion-dollar intelligence contract. After Ashcroft's resignation from government, he founded a lobbying firm, The Ashcroft Group, which Oracle hired in 2005. With the group's help, Oracle went on to acquire the contract. Computer Sciences Corporation reportedly spent a billion dollars developing a computer system for the United States Air Force that yielded no significant capability, because, according to an Air Force source, the Oracle software on which the system was based could not be adapted to meet the specialized performance criteria. Oracle Corporation was awarded a contract by the State of Oregon's Oregon Health Authority (OHA) to develop Cover Oregon, the state's healthcare exchange website, as part of the U.S. Patient Protection and Affordable Care Act. When the site tried to go live on October 1, 2013, it failed, and registrations had to be taken using paper applications until the site could be fixed. On April 25, 2014, the State of Oregon voted to discontinue Cover Oregon and instead use the federal exchange to enroll Oregon residents. The cost of switching to the federal portal was estimated at $5 million, whereas fixing Cover Oregon would have required another $78 million. Oracle president Safra Catz responded to Cover Oregon and the OHA in a letter claiming that the site's problems were due to OHA mismanagement, specifically that a third-party systems integrator was not hired to manage the complex project. In August 2014, Oracle Corporation sued Cover Oregon for breach of contract, and then later that month the state of Oregon sued Oracle Corporation, in a civil complaint for breach of contract and "racketeering". In September 2016, the two sides reached a settlement which included a $100 million payment from Oracle to the state, and a six-year agreement for Oracle to continue modernizing state software and IT. On January 27, 2010, Oracle announced it had completed its acquisition of Sun Microsystems— valued at more than $7 billion—a move that transformed Oracle from solely a software company to a manufacturer of both software and hardware. The acquisition was delayed for several months by the EU Commission because of concerns about MySQL, but was unconditionally approved in the end. This acquisition was important to some in the open source community and also to some other companies, as they feared Oracle might end Sun's traditional support of open source projects. Since the acquisition, Oracle has discontinued OpenSolaris and StarOffice, and sued Google over their newly acquired Java patents from Sun. In September 2011, U.S. State Department Embassy cables were leaked to Wikileaks. One cable revealed that the U.S. pressured the E.U. to allow Oracle to acquire Sun. On August 12, 2010, Oracle announced a lawsuit against Google concerning patent and copyright infringement of Java in Google's development of Android. Oracle claimed that "Google’s Android competes with Oracle America’s Java" and that "Google has been aware of Sun’s patent portfolio ... since Google hired certain former Sun Java engineers." Oracle acquired the Java patents when it bought Sun Microsystems in January 2010. Google's reimplementation of the Java platform supports most Java functionality, apart from AWT and Swing, instead supplying a native widget toolkit. Oracle originally sought damages up to $6.1 billion, but this valuation was rejected by a federal judge who asked Oracle to revise the estimate. In May 2012, the jury in this case found that Google did not infringe on Oracle's patents, and the trial judge ruled that the structure of the Java APIs used by Google was not copyrightable. On September 5, 2012, Oracle was ordered by a federal judge to pay Google's legal fees, which were over $1 million. Google has accused Apple, Oracle and Microsoft of trying to take down Android through patent litigation, rather than innovating and competing with better products and services. In August 2011, Google started the process of purchasing Motorola Mobility for US$12.5 billion, which was viewed in part as a defensive measure to protect Android, since Motorola Mobility holds more than 17,000 patents. In late May 2012, it successfully completed acquisition of the company, thus adding its patents portfolio virtually unto its own, as a potential defensive measure. Google has also acquired thousands of patents from IBM. On August 13, 2010, an internal Oracle memo leaked to the Internet cited plans for ending the OpenSolaris operating system project and community. With Oracle planning to develop Solaris only in a closed source fashion, OpenSolaris developers moved to the Illumos and OpenIndiana project, among others. As Oracle completed their acquisition of Sun Microsystems in February 2010, they announced that OpenSSO would no longer be their strategic product. Shortly after, OpenSSO was forked to OpenAM. and will continue to be developed and supported by ForgeRock. On September 6, 2010, Oracle announced that former Hewlett-Packard CEO Mark Hurd is replacing Charles Phillips as Oracle Co-President. Apparently Phillips had wanted to leave Oracle since December 2009. "Oracle is clearly capitalizing on this opportunity to get someone strong from a top hardware company," said Forrester analyst James Staten. "In terms of how this helps Oracle against IBM, there is reason to be optimistic." Mark Hurd resigned from HP "after an investigation of his relationship with a female contractor found he violated the company's business standards." HP said Hurd "didn't violate the company's policy regarding sexual-harassment." On September 7, 2010, HP announced a civil lawsuit against Mark Hurd "to protect HP's trade secrets." On September 20, Oracle and HP published a joint press release announcing the resolution of the lawsuit on confidential terms and reaffirming commitment to long-term strategic partnership between the companies. A number of OpenOffice.org developers had formed The Document Foundation and had received backing by Google, Novell, Red Hat, and Canonical, as well as some others, but were unable to get Oracle to donate the brand OpenOffice.org, causing a fork in the development of OpenOffice.org with the foundation now developing and promoting LibreOffice. Oracle has expressed no interest in sponsoring the new project and has asked the OpenOffice.org developers that have started the project to resign from the company due to "conflicts of interest." On November 1, 2010, 33 of the OpenOffice.org developers gave their letters of resignation. On June 1, 2011, Oracle donated OpenOffice.org to the Apache Software Foundation. On June 15, 2011, HP filed a lawsuit in California Superior Court in Santa Clara, claiming that Oracle had breached an agreement to support the Itanium microprocessor used in HP's high-end enterprise servers. Oracle called the lawsuit "an abuse of the judicial process" and said that had it known SAP's Leo Apotheker was about to be hired as HP's new CEO, any support for HP's Itanium servers would not have been implied. On August 1, 2012, a California judge said in a tentative ruling that Oracle must continue porting its software at no cost until HP discontinues its sales of Itanium-based servers. HP was awarded $3 billion in damages against Oracle in 2016. HP argued Oracle's canceling support damaged HP's Itanium server brand. Oracle has announced it will appeal both the decision and damages. On August 31, 2011, The Wall Street Journal reported that Oracle was being investigated by the Federal Bureau of Investigation for paying bribes to government officials in order to win business in Africa, in contravention of the Foreign Corrupt Practices Act (FCPA). On April 20, 2012 the US General Services Administration banned Oracle from the most popular portal for bidding on GSA contracts for undisclosed reasons. Oracle has previously used this portal for around four hundred million dollars a year in revenue. Oracle previously settled a lawsuit filed under the False Claims Act, which accused the company of overbilling the US government between 1998 and 2006. The 2011 settlement forced Oracle to pay $199.5 million to the General Services Administration. Larry Ellison: CEO since he co-founded the company in 1977 until stepping down in 2014, and Chairman from 1990 to 2004. From September 2014 executive chairman and CTO. He owns 25% of the company. Safra Catz: Co-CEO since September 2014, previously co-President (since 2004) and CFO. In 2009, she was ranked by Fortune as the 12th most powerful woman in business. Mark Hurd: Co-CEO since September 2014, previously co-President (since 2010). In 2007, Mark Hurd was ranked #16 on Fortune's list of the 25 Most Powerful People in Business. Bob Miner: Co-founder of the company and co-architect of Oracle Database. Led product design and development for Oracle Database from 1977 to 1992. Spun off a technology group within Oracle in 1992. Oracle board member until 1993. Ed Oates: Co-founder of the company. Retired from Oracle in 1996. Bruce Scott: One of the first employees (number 4) at Oracle (then Software Development Laboratories), Scott served as the co-author and co-architect of Oracle V1, V2 and V3. Umang Gupta: Former Vice President and General Manager (joined in 1981). Wrote the first business plan for the company. Current Chairman and CEO of Keynote Systems, Inc.
Jeff Henley: Vice Chairman (since September 2014) Chairman (2004–2014). Previously CFO of Oracle (1991–2004). Charles Phillips: Past Co-President, replaced by Mark Hurd. 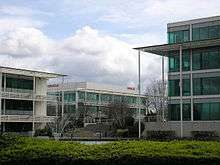 Oracle Corporation has its overall headquarters on the San Francisco Peninsula in the Redwood Shores area of Redwood City, adjacent to Belmont and near San Carlos Airport (IATA airport code: SQL). Oracle HQ stands on the former site of Marine World Africa USA, which moved from Redwood Shores to Vallejo in 1986. Oracle Corporation originally leased two buildings on the site, moving its finance and administration departments from the corporation's former headquarters on Davis Drive, Belmont, California. Eventually, Oracle purchased the complex and constructed a further four main buildings. The distinctive Oracle Parkway buildings, nicknamed the Emerald City, served as sets for the futuristic headquarters of the fictional company "NorthAm Robotics" in the Robin Williams film Bicentennial Man (1999). The campus represented the headquarters of Cyberdyne Systems in the movie Terminator Genisys (2015). 300 Oracle Parkway at Oracle Corporation headquarters in Redwood Shores, California. Oracle Corporation operates in multiple markets and has acquired several companies which formerly functioned autonomously. On October 20, 2006, the Golden State Warriors and the Oracle Corporation announced a 10-year agreement in which the Oakland Arena would become known as the Oracle Arena. Larry Ellison's sailing team competes as Oracle Team USA. The team has won the America's Cup twice, in 2010 (as BMW Oracle Racing) and in 2013. Sean Tucker's "Challenger II" stunt biplane performs frequently at air shows around the US. 1 2 3 4 5 "Oracle Corporation 2016 Annual Report Form (10-K)". EDGAR. United States Securities and Exchange Commission. February 27, 2016. Retrieved December 21, 2015. ↑ "Q4 FY16 SaaS and PaaS Revenues Were Up 66%, and Up 68% in Constant Currency" (Press release). Oracle Corporation. June 16, 2016. Retrieved July 30, 2016. ↑ "Global Software Top 100 - Edition 2011". softwaretop100.org. Retrieved August 23, 2011. ↑ "Oracle's 30th Anniversary" (PDF). Profit. Oracle Corporation. May 2007. p. 26. Retrieved July 16, 2010. ↑ Codd, E. F. (1970). "A Relational Model of Data for Large Shared Data Banks". Communications of the ACM. 13 (6): 377–387. doi:10.1145/362384.362685. ↑ "Oracle's 30th Anniversary" (PDF). Profit. Oracle Corporation. May 2007. p. 29. Retrieved July 16, 2010. ↑ "Oracle Systems Corporation Renamed 'Oracle Corporation'" (Press release). Oracle Corporation. June 1, 1995. Retrieved April 17, 2015. ↑ Radhakrishna, Kishore; Shanmugam, Ravisankar (2015). "1.4 Additional documentation". Oracle E-Business Suite 12.2.4 Installation and Upgrade on IBM Power S824 (1 ed.). IBM Redbooks. p. 7. ISBN 9780738454542. Retrieved July 31, 2016. Oracle software and documentation can be downloaded from the Oracle Software Delivery Cloud website at: https://edelivery.oracle.com/ You need to have a valid license agreement with Oracle Corporation to download any software from the Oracle E-Delivery location. ↑ "Top 60 Licensing Pitfalls For Oracle Databases And Oracle Technology Products". OMT-CO Operations Management Technology Consulting GmbH. Retrieved April 21, 2013. ↑ "Oracle Announces General Availability of Oracle Database 12c, the First Database Designed for the Cloud" (Press release). Oracle Corporation. July 1, 2013. Retrieved July 1, 2013. ↑ Taft, Darryl K (October 18, 2011). "Oracle to Boost Data Management With Endeca Buy". eWeek. Ziff Davis. Retrieved November 3, 2011. Oracle also announced the Oracle NoSQL Database, a distributed, highly scalable, key-value database. ↑ Lai, Eric (May 4, 2009). "Oracle aims at Microsoft with upgraded Beehive collaboration". Computerworld. Retrieved May 15, 2009. ↑ "Knoa Experience and Performance Manager (EPM) for Oracle Siebel CRM". Oracle Corporation. Archived from the original on October 18, 2013. ↑ Jackson, Joab (July 2, 2013). "Oracle Enterprise Manager 12c gears up for the private cloud". Infoworld. Retrieved March 12, 2014. ↑ Harris, Paul Eastwood (2010). Project Planning and Scheduling Using Primavera P6: For All Industries Including Version 4 to 7 ; Planning and Progressing Project Schedules with and Without Roles and Resources in an Established Enterprise Environment. Eastwood Harris Pty Ltd. pp. 2–1. ISBN 9781921059346. Retrieved April 29, 2015. Primavera is an Enterprise Project Management software package that enables many projects to be managed in one database. ↑ Grancher, Eric (May 15, 2009). "Oracle and storage IOs, explanations and experience at CERN" (PDF). CERN-IT-Note-2009-005. Geneva: CERN. p. 4. Retrieved January 17, 2010. The Oracle Exadata storage server version 1 is a solution developed by Oracle and HP in which part of the processing, normally performed by the database instance, is performed at the storage system level. ↑ King, Rachel (July 15, 2013). "Oracle Exalytics in-memory machine updated to analyze larger data sets". ZDNet. Retrieved March 12, 2014. ↑ Vijayan, Jaikumar (September 22, 2011). "New Oracle database appliance aims at small, mid-size firms: Analysts don't expect Database Appliance to cannibalize Oracle's Exadata enterprise offering". Computerworld. Retrieved January 8, 2012. The tightly integrated hardware, software and storage bundle features Oracle Database11g Release 2 and Real Application Clusters software running on a 2-node, 24-processor core, Sun Fire server cluster hardware. ↑ "Oracle Unveils the Oracle Big Data Appliance" (Press release). Oracle Corporation. October 3, 2011. Retrieved April 17, 2015. ↑ "Oracle Unveils the World's Fastest General Purpose Engineered System - the SPARC SuperCluster T4-4" (Press release). Oracle Corporation. September 26, 2011. Retrieved February 18, 2012. 1 2 3 "Enterprise Cloud Computing SaaS, PaaS, IaaS". Oracle. Retrieved December 18, 2014. ↑ "Oracle Applications Cloud". Oracle. Retrieved March 13, 2014. ↑ "Oracle (ORCL) Announces New Cloud Platform Additions". Street Insider. June 22, 2015. Retrieved April 15, 2016. With more than 24 new cloud services, the Oracle Cloud Platform extends Oracle's leadership with the world's broadest and deepest portfolio of SaaS, PaaS and IaaS. Newly available Oracle Cloud services include, Oracle Database Cloud - Exadata, Oracle Archive Storage Cloud, Oracle Big Data Cloud, Oracle Integration Cloud, Oracle Mobile Cloud, and Oracle Process Cloud. ↑ Di Martino, Beniamino; Cretella, Giuseppina; Esposito, Antonio (2015). "4.3 Oracle PaaS". Cloud Portability and Interoperability: Issues and Current Trends. SpringerBriefs in Computer Science. Springer. p. 68. ISBN 9783319137018. Retrieved 2016-09-20. The Oracle cloud platform [...] is a portfolio of products that can be used to build applications to publish as services on both private and public clouds. The platform is based on the Oracle Grid technologies, as well as on applications that include WebLogic Server, Coherence in-memory datagrid, and JRockit JVM. In terms of infrastructure, the platform is based on the Oracle IaaS offer that contains Oracle Solaris, Oracle Enterprise linux, and Oracle VM for virtualization, Sun SPARC and Storage. ↑ Cao, Jing; Womack, Brian (July 29, 2016). "Oracle Purchase of NetSuite Will Help It Vie With Cloud Rivals". Bloomberg. ↑ "Global Customer Support Security Practices" (PDF). Oracle Corporation. April 1, 2008. p. 1. Retrieved August 25, 2008. Your registration on MetaLink uses a unique Customer Support Identifier (CSI) linked to your Support contract. ↑ "Critical Patch Updates and Security Alerts". Oracle Corporation. Archived from the original on October 28, 2006. ↑ Douglas, Williams; et al. (November 2010). "Oracle Real Application Clusters Installation Guide, 11g Release 2 (11.2) for Linux and UNIX" (PDF). Oracle Corporation. p. xxi. Retrieved November 22, 2010. Oracle Configuration Manager: This feature [...] was previously named Customer Configuration repository (CCR). It is an optional component for database and client installations. Oracle Configuration Manager gathers and stores details relating to the configuration of the software stored in database Oracle home directories. ↑ "Oracle Auto Service Request for Sun Systems". Oracle Corporation. April 2011. Oracle Auto Service Request for Sun Systems. ↑ Burleson, Donald (October 30, 2008). "My Oracle Support Community ("mosque") to replace Metalink". Burleson Consulting. Instead of announcing a new and improved Metalink, the Oracle marketing geniuses' graced the upgrade with its own name, the My Oracle Support Community (MOSC). ↑ "Oracle University". Oracle Corporation. ↑ Abelson, Ree (June 23, 1996). "Truth or Consequences? Hardly". The New York Times. ↑ Galante, Suzanne (June 9, 1997). "Informix drops Oracle lawsuit". CNET. 1 2 "Infrastructure | Oracle Analyst Reports" (PDF). Oracle.com. September 7, 2010. Archived from the original (PDF) on October 31, 2008. Retrieved July 7, 2011. ↑ DB-Engines Ranking - popularity ranking of database management systems. Db-engines.com. Retrieved July 14, 2013. ↑ Lai, Eric (November 20, 2006). "Vonage places call for EnterpriseDB database". Computerworld. ↑ Gullo, Karen & Guglielmo, Connie (March 22, 2007). "Oracle Claims Rival SAP Stole Software and Data (Update4)". Bloomberg. Retrieved March 22, 2007. ↑ Pendse, Nigel (March 7, 2008). "Consolidations in the BI industry". The OLAP Report. ↑ "Best Donation Management Software - 2015 Reviews of the Most Popular Systems". Retrieved April 17, 2015. ↑ "Oracle – the No.1 Database for Deploying SAP Applications". Oracle Corporation. Retrieved November 11, 2008. Two thirds of SAP customers around the world, in every industry, choose to run their applications on Oracle databases. ↑ "Oracle Helping SAP Customers to get 'OFF SAP'" (Press release). Oracle Corporation. June 14, 2005. ↑ "Oracle sues SAP". Oracle Corporation. July 3, 2007. ↑ "SAP Responds to Oracle Complaint" (PDF) (Press release). SAP. July 3, 2007. Retrieved September 2, 2016. ↑ Levine, Dan (November 23, 2010). "SAP to pay Oracle $1.3 billion in landmark decision". Reuters. Retrieved November 23, 2010. ↑ "Judge overturns Oracle's $1.3B award against SAP". ITworld. September 1, 2011. Retrieved September 5, 2011. ↑ "Oracle Says SAP to Pay $306 Million in Copyright Deal". Bloomberg BusinessWeek. August 3, 2012. Retrieved August 6, 2012. ↑ Lemos, Robert (February 6, 2002). "Guru says Oracle's 9i is indeed breakable". CNET News. Retrieved October 5, 2011. ↑ Farber, Dan (December 9, 2004). "Oracle joins or refashions the information age". ZDNet. Retrieved October 9, 2014. ↑ "Executive Strategy Weekly Edition". Oracle Information inDepth Newsletters. Oracle Corporation. January 7, 2009. Retrieved September 21, 2009. In the first installment of the Oracle ClearView video series, host Richard Levitt explains how Oracle Exadata—the combination of superfast HP hardware and supersmart Oracle software—is bringing powerful benefits to the enterprise. ↑ "Bugs bust open 'unbreakable' Oracle 9i". ZDNet. February 7, 2002. ↑ "Oracle security claim". The Register. January 16, 2002. ↑ "How to hack unbreakable Oracle". The Register. February 7, 2002. ↑ "Oracle list of major Security certifications" (PDF). Oracle Corporation. ↑ "Ashcroft breaks with tradition by lobbying, has earned $269,000". Chicago Tribune. January 10, 2006. ↑ "How the Air Force blew $1B on a dud system". Air Force Times. November 2012. Retrieved April 17, 2015. ↑ "Cover Oregon: State moves to federal exchange, but Oracle technology lives on". The Oregonian. Retrieved April 17, 2015. ↑ "Oracle blasts Oregon for spreading Cover Oregon 'false narrative'". The Oregonian. Retrieved April 17, 2015. ↑ "Oregon health exchange technology troubles run deep due to mismanagement, early decisions". The Oregonian. Retrieved April 17, 2015. ↑ Manning, Jeff (August 8, 2014). "Cover Oregon: Oracle comes out swinging, files lawsuit, accuses Kitzhaber of 'campaign'". Oregon Live. Retrieved August 27, 2014. ↑ Gallagher, Sean (August 25, 2014). "Oregon Attorney General sues Oracle for 'racketeering activity'". Ars Technica. Retrieved August 27, 2014. ↑ Foden-Vencil, Kristian (15 September 2016). "Oregon, Oracle Reach $100 Million Settlement Over Cover Oregon Healthcare Exchange. News | OPB". Oregon Public Broadcast. Retrieved 16 September 2016. ↑ "Mergers: Commission clears Oracle's proposed acquisition of Sun Microsystems" (Press release). European Commission. January 21, 2010. Retrieved April 17, 2015. ↑ Vance, Ashlee (September 21, 2010). "Oracle Growth Plans Worry Rivals and Customers". The New York Times. ↑ Widenius, Monty. "Save MySQL!". Retrieved January 31, 2010. [Signer hereby asks] competition authorities around the world to block Oracle's acquisition of Sun unless one of the structural solutions selected by [signer] below is put in place as a legally binding requirement: (select at least one; all combinations are possible) MySQL must be divested to a suitable third party that can continue to develop it under the GPL. Oracle must commit to a linking exception for applications that use MySQL with the client libraries (for all programming languages), for plugins and libmysqld. MySQL itself remains licensed under the GPL. Oracle must release all past and future versions of MySQL (until December 2012) under the Apache Software License 2.0 or similar permissive license so that developers of applications and derived versions (forks) have flexibility concerning the code. ↑ Paul, Ryan (April 20, 2009). "Oracle buys Sun: understanding the impact on open source". Ars Technica. Retrieved March 6, 2011. ↑ Fiveash, Kelly (March 9, 2010). "Open source boss quits Oracle". The Register. ↑ Paul, Ryan (August 14, 2010). "Oracle's Java lawsuit undermines its open source credibility". Ars Technica. Retrieved March 6, 2011. ↑ Weintraub, Seth (August 12, 2010). "Oracle files suit over Android's use of Java". CNN. Retrieved January 31, 2011. ↑ "Secret US Embassy Cables". Wikileaks. ↑ Mick, Jason (September 1, 2011). "U.S. Pressured EU to Approve the Oracle's Acquisition of Sun". Daily Tech. ↑ "Justice Department sues Oracle, alleging fraud". CNET. Retrieved April 17, 2015. ↑ Whistleblower Lawsuit Results in Nearly $200 Million Settlement. Kellergroverwhistleblowerlawyers.com (October 6, 2011). Retrieved 2013-07-14. ↑ Krazit, Tom (August 12, 2010). "Oracle sues Google over Android and Java". CNET. Retrieved July 7, 2011. ↑ Ha, Anthony (August 12, 2010). "Oracle sues Google over Android". VentureBeat. Retrieved July 7, 2011. ↑ Shankland, Stephen (August 13, 2010). "Why Oracle, not Sun, sued Google over Java". CNET News. Retrieved July 7, 2011. ↑ Hashimi, Sayed; Komatineni, Satya; MacLean, Dave (March 5, 2010). "The History of Google Android". CTO Edge. Retrieved July 7, 2011. ↑ "Oracle seeks up to $6.1 billion in Google lawsuit". Reuters. June 18, 2011. Retrieved September 7, 2011. ↑ "Judge tosses Oracle's $6.1 billion damage estimate in claim against Google". San Jose Mercury News. July 22, 2011. Retrieved September 7, 2011. ↑ Lowensohn, Josh (May 23, 2012). "Jury clears Google of infringing on Oracle's patents". ZDNet. Retrieved May 25, 2012. ↑ Mullin, Joe (May 31, 2012). "Google wins crucial API ruling, Oracle's case decimated". Ars Technica. Retrieved May 31, 2012. ↑ "Oracle Must Pay Google $1 Million in Legal Fees". Mashable. September 5, 2012. Retrieved September 6, 2012. ↑ "Google publicly accuses Apple, Microsoft, Oracle of patent bullying". Ars Technica. Retrieved September 28, 2011. ↑ "Google, needing patents, buys Motorola wireless for $12.5 billion". Ars Technica. Retrieved September 28, 2011. ↑ Letzing, John (January 4, 2012). "Google, Oracle Get Trial Date In Android Patent Dispute". The Wall Street Journal. Retrieved January 5, 2012. ↑ Stallion, Steven (August 13, 2010). "OpenSolaris is Dead.". Iconoclastic Tendencies. Retrieved September 7, 2011. ↑ Larabel, Michael (September 10, 2010). "OpenIndiana – Another OpenSolaris Fork – Coming Next Week". Phoronix. Retrieved September 13, 2010. 1 2 "Oracle kills OpenSSO Express – ForgeRock steps in – The H Open Source: News and Features". H-online.com. February 24, 2010. Archived from the original on December 8, 2013. Retrieved July 7, 2011. ↑ "Oracle investors cheer ex-HP boss Hurd's arrival". Reuters. Retrieved April 17, 2015. ↑ Worthen, Ben (August 7, 2010). "H-P Chief Quits in Scandal". The Wall Street Journal. Retrieved January 12, 2015. ↑ "Court Filing: HP Civil Complaint Against Mark Hurd". Archived from the original on September 9, 2010 – via Scribd. ↑ "HP and Oracle Reaffirm Commitment to Long-term Strategic Partnership" (Press release). September 20, 2010. Retrieved September 5, 2011. ↑ "And So The Exodus Begins – 33 Developers Leave OpenOffice.org". Digitizor.com. November 1, 2010. Retrieved July 7, 2011. ↑ "Oracle Donates OpenOffice to the Apache Software Foundation". ReadWriteWeb. June 1, 2011. Retrieved September 5, 2011. ↑ Clark, Jack (June 16, 2011). "HP unleashes lawyers on Oracle over Itanium support". ZDNet UK. Retrieved June 17, 2011. ↑ "HP, Oracle exchange court jabs in escalating Itanium support showdown". ZDNet. July 7, 2011. Retrieved September 5, 2011. ↑ "Oracle fires back at HP in Itanium suit, doesn't mince words". ZDNet. August 30, 2011. Retrieved September 5, 2011. ↑ McMillan, Robert (August 1, 2012). "HP Wins Big Victory Over Oracle in Battle of the Itanium". Wired. Retrieved August 6, 2012. ↑ Farrar, James (August 31, 2011). "Oracle under fire over ethics again: Feds investigating bribery for business in Africa". ZDNet. Retrieved June 15, 2013. ↑ "Feds Banish Oracle From Popular Contract Vehicle". InformationWeek. Retrieved April 17, 2015. ↑ "Oracle to Pay $199.5 Million to Settle Overbilling Charges". The New York Times. October 7, 2011. Retrieved September 16, 2013. ↑ Rich, Laura (July 23, 2010). "When it comes to acquistion [sic] plans, it's Oracle vs Oracle". CNNMoney.com. Retrieved March 27, 2011. ↑ "Trivia for Bicentennial Man". Internet Movie Database. Retrieved March 27, 2011. ↑ "Trivia for Terminator Genisys". Internet Movie Database. Retrieved July 9, 2015. ↑ "Golden State Warriors, Oracle Reach Arena Naming Rights Agreement". National Basketball Association. October 20, 2006. ↑ Shankland, Stephen (February 16, 2010). "Ellison's team wins long-sought sailing trophy". CNET. ↑ "Oracle Team USA stages massive comeback to win 34th America's Cup". America's Cup. September 25, 2013. Retrieved March 12, 2014. ↑ "Team Oracle Sponsors and Suppliers". Oracle Corporation. Mendelsohn, Andrew. "The Oracle Story: 1984-2001". IEEE Annals of the History of Computing. 35 (2): 10–23. doi:10.1109/MAHC.2012.56. Wikimedia Commons has media related to Oracle Corporation.